Saudi Arabia is one of the richest countries in the world with its oil reserves. Declining oil prices and rising domestic energy demand though are forcing the kingdom to look for alternative sources. A new study certifies that the country has 'high wind potential' and an initial call for tenders is already underway. So far, the Arabian Peninsula has been a white spot on the world's wind maps. One reason for this is that until recently Saudi Arabia was rather shielded from the rest of the world. On the other hand almost infinite oil reserves were considered to secure the energy supply far into the future. However, there's been a new approach for some time. Carefully, the kingdom opens up. Women, for example, have finally been allowed to drive. And the energy supply is supposed to be restructured. 'Vision 2030' under the leadership of Crown Prince Mohammad bin Salman bin Abdulaziz Al-Saud, who is also Chairman of the Council of Economic and Development Affairs, describes that alternative energy sources should contribute to the electricity mix. Falling oil prices have increasingly affected Saudi Arabia. So far, extensive social benefits financed with the oil wealth for the more than 30 million inhabitants, ensured inner peace and stability. But for how much longer? To assess the potential for wind energy, a cooperation between the University of Notre Dame in the US and the King Abdullah University of Science and Technology in Thuwal, Saudi Arabia, has now been established. 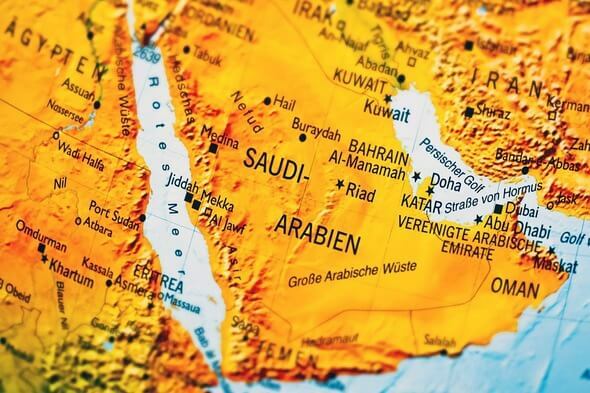 A group of scientists led by Marc Genton investigated how the latest regional climate models could provide an analysis of the potential for wind energy on the Arabian Peninsula - a region that has very few wind speed data yet, but also a complex topography with diverse terrain forms and different meteorology. “While we knew that Saudi Arabia has regions of high wind-power density, particularly along the Red Sea coast and over areas in the southeast and adjacent to the Persian Gulf, this work revealed considerable potential for wind energy in other regions during specific seasons,” explains Wanfang Chen, a postgraduate student in Genton’s team. The MENA-CORDEX model predicts a number of high-potential areas of great wind-power density for many decades making these areas promising locations for harvesting wind energy. The overall results of the simulation tests were much better than expected. According to the researchers, Saudi Arabia has "significant wind energy potential". Meanwhile, the government has launched tenders to bring renewable energy to Saudi Arabia. Four consortia have applied for a contract worth 500 million dollars to build the country's first wind farm. The winner of the development rights of the 400 MW Dumat Al Jandal wind farm in the northern Al-Jouf region will be decided on 8 December 2018. The contract will be accompanied by a 20-year-PPA with the Saudi Power Procurement Company. When completed, the wind farm could generate enough electricity to supply up to 70,000 Saudi households. “The Kingdom’s first utility-scale wind project opens a new chapter in our journey toward a diversified energy mix. The development of a wind energy industry in Saudi Arabia is an important component of our wider industrial diversification strategy,” said Khalid Al-Falih, minister of energy, industry and mineral resources, according to albawaba. This is the second call for proposals launched by the Ministry as part of the National Renewable Energy Program. Aim of the programme is to increase the share of renewable energies to 3.45 GW by 2020 - this corresponds to 4 percent of total energy production. By 2023, this share is to rise to 9.5 GW corresponding to 10 percent of total production. French company EDF Energies Nouvelles and Abu Dhabis Masdar placed the lowest bid of $21.30/MWh. Engie and the consortium ACWA Power from Saudi Arabia and Martifer Renewables from Portugal also bid. Highest bid came from Enel Green Power of Italy in cooperation with local company Al Babtain Contracting amounting to $33.86/MWh, Clean Technica reports.